From art lovers to history buffs, Antwerp has something for everyone. With beautiful Renaissance and Gothic-style buildings, famous Flemish art, and the oldest animal park in Belgium, Antwerp is a charming place to blend the past with the present. Thanks to VISITFLANDERS, the supplier sponsor for this article, you will not miss a moment of Antwerp’s exciting activities. Antwerp, reigning as the most populous city proper in Belgium, is the capitol of the Antwerp province in the state of Flanders. It is an area rich with an artistic and creative past and present. The city was noted in the 16th century for the wealth of its residents, and this can, be seen in many of the historic buildings and landmarks seen today; the houses of these well off merchants, manufacturers, and creators have been preserved. The city has much to offer any visitor, whether it be a family vacation, a honeymoon, or a self-discovery solo trip! 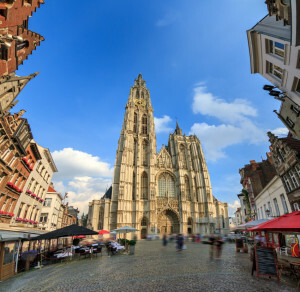 The Cathedral of Our Lady, a Gothic-style Roman Catholic cathedral located in Antwerp, is one not to miss on your vacation. Not only is the Belfry of the cathedral listed as a UNESCO World Heritage Site, but the building itself contains quite a few baroque paintings and significant works from artists such as Peter Paul Rubens and Marten de Vos. Rubens is considered the most influential of the Flemish Baroque artists, and his presence is found through out Antwerp; in fact, two of his works found within the cathedral were once confiscated by Napoleon but were later returned to their real home in the Cathedral of Out Lady in Antwerp. Rubenshuis, or “Rubens House,” was once the studio of artist Peter Paul Rubens; now it stands as a museum, and a lovely way to spend an afternoon in Antwerp. Rubens designed the studio himself based on studies of Italian Renaissance palace architecture, and construction began in 1610. He spent most of his life in this magnificent palace, for it not only contained his studio, but his home, a monumental portico, and an interior courtyard. Rubens also designed the baroque garden the courtyard opens up into. Spend an afternoon gazing on many of Rubens’ works, like Adam and Eve: a painting from the year 1600. Another unique feature of the building is the Rubenianum, a centre located back by the garden devoted to the study of Peter Paul Rubens. 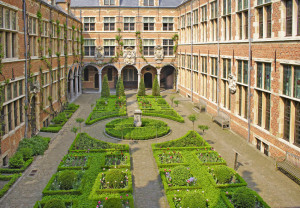 Plantin-Moretus Museum is another museum honoring important people in Antwerp’s creative and artistic past. Focusing on the work of 16th century printers Christophe Plantin and Jan Moretus, this printing museum contains a vast collection of typographical material, including the two oldest surviving printing presses in the world! The site was listed as a UNESCO World Heritage Site in 2005, and has a beautiful and preserved interior reflective of the time in which Plantin and Moretus worked there. Another museum with a unique history worth a visit is the Red Star Line Museum. Opened in 2013, this museum chronicles the Red Star Line ocean passenger line. The main feature of the museum is the stories of past travelers; one of notable mention is Albert Einstein. Between 1873 and 1935 the Red Star Line was major, and aided Europeans in passage from Antwerp to the US and Canada, seeking a better life; this makes it very important to the history of immigration. The museum itself is made up of the former warehouse buildings of the company, and once inside you can follow the path that many travelers had before, making the museum not just educational but immersive. If you are looking for something a little more interactive and varied, The Antwerp Zoo is another wonderful Antwerpian legacy to visit on your Belgian holiday. The oldest animal park in the country, and one of the oldest in the world, the Antwerp Zoo and its sister park Planckendael house over 7,000 animals; the Antwerp Zoo has also played a large role in breeding programs for several endangered species. 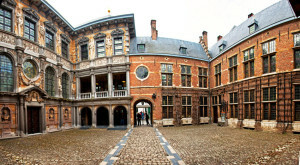 Due to its age, the Antwerp zoo has many older buildings that have been well-preserved over the years and can be found through out the animal park. The entrance to the zoo itself is one of these standing structures, as well as the reptile building, built in 1910, and the aquarium, built in 1910. 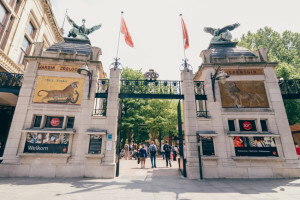 If you are looking to spend an afternoon looking on an array of different creatures and exploring one of the most prominent features of Antwerp, visiting the Antwerp Zoo is right up your alley! When you are done there, you can hop right over to the Antwerpan-Centraal Railway Station, located next to the zoo. Regarded as the finest example of railway architecture in Belgium, the Antwerpan-Centraal railway station is still in use today and whether you get on the train or not it is definitely something to see during your stay in Antwerp. If you are in the mood for soaking in the wonders of the city from outside, you cannot pass up an afternoon spent walking through The Grote Markt of Antwerp. 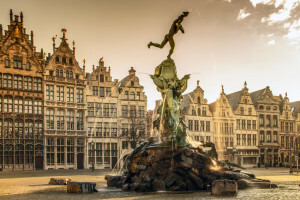 Situated in the heart of the old city quarter and at walking distance from the Scheldt River, the square contains the tourist office, and the Antwerp Jazz Club among other things. You can relax with a cup of coffee or glass of wine at one of the many cafes and restaurants located within the square. Or, if you visit during the winter, you can experience the Christmas Market that takes place in the square. City Hall, or The Stadhuis of Antwerp, is also located within the grote markt. A UNESCO World Heritage Site, city hall incorporates both Flemish and Italian influences when it comes to architecture, and even became an example for the new Renaissance style of architecture in Northern Europe and the Netherlands. Not far south of the grote markt is Saint Anna’s Tunnel: a walking tunnel built under the river to connect to the left bank. Preserved in its original form with wooden escalators and old fashioned warning signs, Saint Anna’s Tunnel is definitely worth a walk through. Once through the tunnel, you can enjoy one of the best skyline views of Antwerp imaginable! Be sure not to miss out on any of the delicious restaurants and cafes found throughout the city during your visit. With all different cuisines and dining options, from fast casual to elegant, eating and drinking in Antwerp is a vacation itself! Zuiderterras can be found along the Scheldt river, and gives the impression of being a boat due to the river views from the dining room. The menu offers traditional meat and fish dishes that include the freshest ingredients, and a creative twist, but the desserts are truly the masterpiece of the menu. From decadent chocolate mousse to raspberry moelleux, Zuiderterras can satisfy your every craving. The even offer a deluxe breakfast that includes champagne! Antwerp also offers various Michelin star restaurants in its thriving and vibrant restaurant scene. ‘t Zilte has not only delicious small course menu items, but the building has some of the best views in the city. From the river to the Cathedral, you can see many fascinating and beautiful landmarks from ‘t Zilte. The Jane is another popular Michelin star restaurant located in Antwerp. From old chapel to booming restaurant, The Jane offers two different starter tasting menus, as well as main course and two desserts! With a view right into the kitchen, you get to see what goes into making a Michelin Star dining experience. Graanmarkt 13 is another hit local spot, mixing fashion and living with food, for each floor is something different. The restaurant, located on the downstairs level, is run by Chef Seppe Nobels who transforms fresh and locally sourced ingredients into delicious dishes. The menu at Graantmarkt 13 even includes quite a few organic wine offerings. The menu at Le John, changes every month, offering both residence and visitors something different to experience, and all of the meals are prepared in a glass front kitchen! Upstairs, Le John is outfitted with a bar; so if you are just feeling like an ice cold beer or a glass of wine, you have that option too. For an option a little more laid back be sure to grab a meal at De Groote Witte Arend, where they offer the atmosphere of a great beer bar and the delicacies of well-priced Flemish home cuisine. In Antwerp there is no shortage of places to go or history to revisit. Thanks to VISITFLANDERS you will not miss a minute of fun on your trip to Antwerp. Learn more about Flanders – Belgium and download the FlandersInsider Sales companion app. The app is available for mobile devices (tablet and mobile) for iOS and Android. Visit Antwerp will provide you with more information on current events and festivals in Antwerp. Experience this vibrant city yourself. It is also the perfect pre and post destination for many European river cruises. © Copyright 2017 Travmarket. LLC. Your source of leisure and corporate travel news from top consumer sources delivered to your inbox daily. Your source of cruise related travel news from top consumer sources delivered to your inbox weekly. Card Mills: Give ’em Shelter? Carnival, what are you thinking? Please support TRO and our Suppliers! The FREE resources and tools available to you are paid for by supplier sponsorship. © 2009 - 2019 Travel Research Online. All rights reserved.